Below you can view all the homes for sale in the Parkborough subdivision located in Centennial Colorado. Listings in Parkborough are updated daily from data we receive from the Denver multiple listing service. To learn more about any of these homes or to receive custom notifications when a new property is listed for sale in Parkborough, give us a call at 720-924-7403. Minutes From Southlands Shopping & Restaurants & E-470 For Fast Commuting! 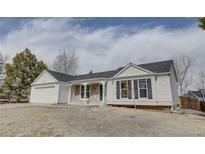 MLS#8300320. Colorado Premier Properties. Check this one out before it's gone! MLS#3412835. RE/MAX MOMENTUM. Great family neighborhood with easy access to shopping, parks and restaurants, golf courses and 470. MLS#4601282. Your Castle Real Estate Inc.
Not to mention, Cherry Creek Schools and no HOA fees! ! MLS#2095541. RE/MAX Professionals.